Resellers - Hi. Thank you your business. We have a new service product. It's called LightJar. Cloud storage services for videos and photos are becoming more common. Each day, families and small businesses create new video recordings, take new photos, and share these recordings with others. 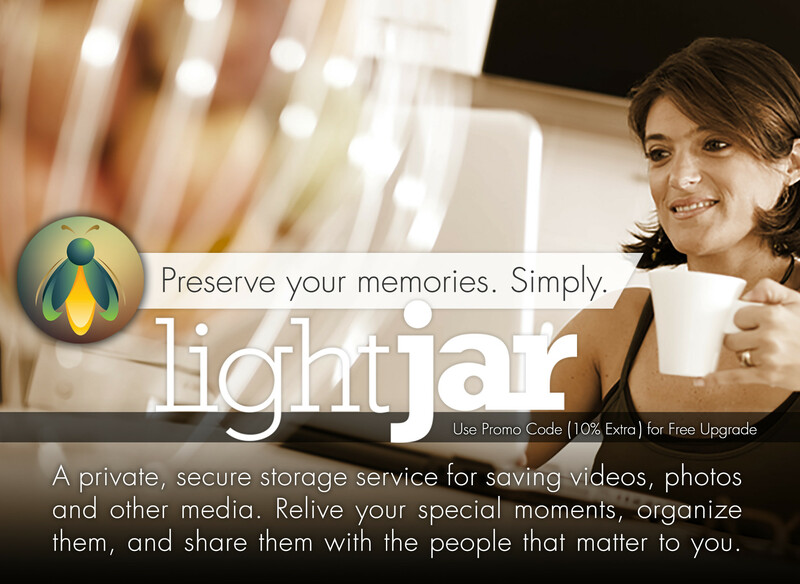 Our LightJar cloud storage service offers a private, secure means to save, organize, and share one's media recordings. It works with any device having a modern browser. For families, LightJar is simple memory protection. For businesses, LightJar can be an essential business tool for better collaboration and backup of important work. Bundle it in your bids to improve your competitiveness. Resell LightJar to improve revenues, or recommend LightJar and receive a commission for as long as your customers use the service. Extend a onetime purchase by your customer into an ongoing relationship, because each time your customer uses LightJar, your company name is on display within the application, and linked back to your home website. Collaborate better with customers and suppliers. Save your hard work, your completed projects. Reseller, or Affiliate, or Both - Resellers purchase a LightJar subscription from our online store at 15% off suggested retail prices, bundle the service in with their customer packages to improve competitiveness, and decide what they want to charge the customer for use of the LightJar service during the first year. Affiliates make 15% commission by referring customers to LightJar via web banners or customer brochures and do not actively sell the service, rather passively refer it. Affiliates receive 15% commission for as long as the customers continue to use LightJar, and are able to track their commissions owed and paid from the LightJar Affiliate website. Commission payments are made via PayPal, and there are no PayPal service fees taken out of commission payments. Both - When Resellers purchase a LightJar subscription for their customers, they should also enter their Affiliate code, so that the Resellers can also receive commissions when their customers re-subscribe to LightJar service after the first year. Competitive advantages of LightJar - It can handle large, long video files with faster uploads and sharing of collections. No native app needs to be installed, but rather LightJar works off your laptop's or smartphone's web browser. We offer eight (8) low end pricing plans to attract new customers. We pay you an ongoing commission for as long as your customers continue to use the service. Additional discounts are given to Affiliates for use of LightJar for their own business, or for the resale of LightJar related media conversion services. Training and Support - LightJar's support team is responsible for handling your customers' questions and support needs. We have an online support center with a video overview on how to use the LightJar service, as well as, sample questions and their answers to the most frequent questions. Subscribers have access to us via a Chat service, and affiliates are always welcome to call us (number given below). Media Kits - We supply the content for website banners, posters on walls, customer brochures, email campaigns, blog posts and social media updates. First, visit LightJar and sign up for the 10GB Monthly Plan. The first 30 days are a free trial. Judge the service, test it out, visit the support center, and determine if this is something that you might use in your own business and/or feel comfortable recommending to your customers. Once satisfied, go to the LightJar Affiliate website and sign up to become a LightJar Affiliate. This website has the important assigned affiliate code, media kits, sample emails, social networking content, URL links for your website or business cards, and a link to your commissions dashboard. The commissions dashboard lists each LightJar subscription made by your referred customers, their email addresses used for signing up to LightJar, commissions owed you, commissions paid, and access to marketing banners. Place the suggested LightJar banners on your website. Download the media kit content for your customized brochures. LightJar is available for resale in our online store for Resellers.